NitroScore can help your college-bound child make smart financial decisions by showing how picking one college or major over another might impact their ability to repay student loans. 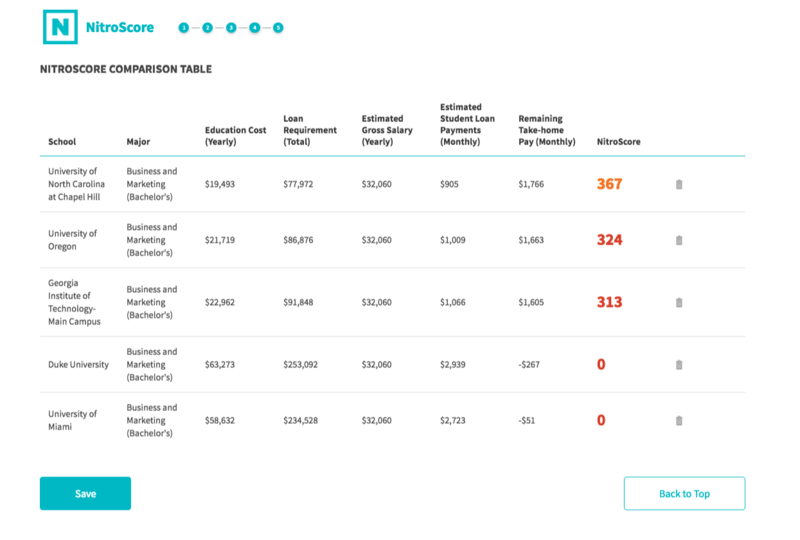 NitroScore provides an easy-to-use online tool to evaluate the earning potential of specific colleges and majors so you can smartly guide your child to make fully informed, financially sound decisions. Is a state school or a private college a better long term value for your child? Which majors offer the best projected earnings potential and the best bet to pay off college loans quickly? Which majors have the worst earnings potential and offer the least likely path to living a comfortable life? What under-the-radar schools are the best values in America? Are those expensive private, even Ivy League, schools really worth it? A college education can cost tens or hundreds of thousands of dollars. Don’t let your college-bound child make the wrong decision. NitroScore can help.